“I was contemplating retirement,” admitted Crystal Palace’s Ashlee Hincks, who left FA Women’s Championship side Millwall in the summer after an up and down year with the Lionesses. On the pitch it was a good season for Hincks and Millwall. The club finished third, just a point behind FA WSL-bound Brighton and went on a long unbeaten run which saw the club become the main challengers to eventual champions Doncaster Rovers Belles. But toward the end of the season things started to spiral off the pitch. “Financial discrepancies” raised in April meant the club nearly went into administration and had to fundraise money just to make it through to the end of the season. With the FA WSL restructure well underway, there were worries about whether the club would even get a license but the damage was already done. Manager Lee Burch and the majority of the first-team squad looked for new challenges in the summer, leaving the Millwall squad almost unrecognizable at the start of the new season and Hincks seeking a new adventure. Hincks joined Palace under the premise they would be in the third tier of the women’s football pyramid this season, renamed the FA Women’s National League for 2018-19. Palace was not one of the clubs handed a license for the second division in the new restructure but was offered a place just three weeks before the new season after the withdrawal of both the Belles and Sheffield FC, leaving the club with little preparation time. “Being completely honest, the squad was being built based on being in the third tier,” admitted Hincks. “The ambition was to build a squad that could get promoted because the club was disappointed not to be awarded tier two status. I think it came as a huge surprise to Palace. Despite the drawbacks, Palace’s start to the season was positive, beating full-time Yeovil in the Continental Cup and following that up with a penalty shootout victory against Tottenham. Palace now face their biggest test yet as they face Hincks’ former club Chelsea, the current FA WSL champions, on Sunday afternoon. With the gap between the two one of the biggest within the top two tiers, Hincks is realistic about Palace’s chance but adds her side to just have to “enjoy” the occasion. “Yeovil were full-time and you couldn’t tell the difference in fitness levels,” she said, before adding, “but Chelsea are a completely different animal. They have some extremely talented players and as a group they’re unbelievable. We’re not naïve, we won’t go there thinking we can go toe to toe but we’ll try to hold them and work on our game in preparation for Lewes and Millwall. The club has come a long way since Hincks left not long after the start of the FA WSL era and before Emma Hayes went about revolutionizing the club toward the position and status they now hold. 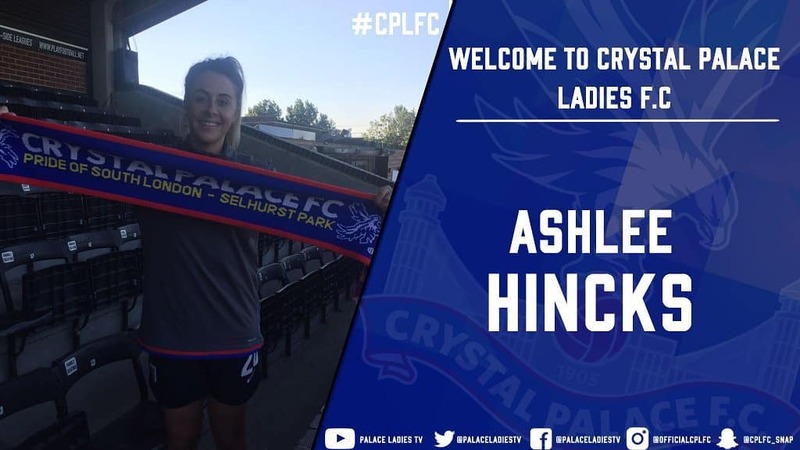 While it would be a miracle if Palace got promoted this season given their late arrival into the league and those above them who had longer to assemble their squads, Hincks admits her chances of playing in the top tier are overdue to recent restructure. Hincks works in recruitment and payrolling outside of football and now says any chance of a return to the top tier is overdue to the completely full-time nature of the FA WSL. But the lack of promotion for Hincks personally won’t stop her being motivated to help her teammates try and achieve the feat, whether it be this season or in the future. “I’m always self-motivated anyway,” she said. “Even if I was in the fifteenth tier, my aim would always be to win. Training eight hours a week, working, and playing at the weekend isn’t easy but there’s plenty in my situation. Hincks says an average day for her will include a “minimum” of four hours travel. She works 9 a.m. to 5 p.m. and will train three evenings a week with Palace before playing at the weekend. It’s fair to say the restructure hasn’t been favorable to players in the same position as Hincks. Brighton captain Vicky Ashton-Jones has dropped out of the top two tiers completely because it was impossible for her to go full-time while others have found themselves in the same position. And Hincks believes the decisions made by The FA have been to benefit those at the very top. “I know they’re only trying to progress women’s football but I think they’re only trying to progress it full-time,” she said. “I just feel like the decisions they make makes women’s football a complete farce. Even little things now like us being in a cup group with Chelsea. That format was there when it was part-time but now there’s such a huge gap, it’s like asking a non-league team to go and play Man United in the men’s game. With the damage done and Hincks approaching 30 at the end of the year, attention now turns to what life may hold after football with the forward accepting a full-time career in the sport will now never be possible. “My job is completely different to football but I like that, it means football doesn’t always take up my mind and I’m more mentally active.